I was so involved with my Wired piece I forgot about the Monday art. In a few days I’ll fudge the dates of publication so it’s neater. This image is a photo of a no-longer surviving copy of a large, 18″ by 24″ or larger poster I made for a party/show in the basement of the house I lived in during college, the Litter Box. As I recall, the bands were Too Cooland also the Truckadelics. Too Cool was this too short-lived postpunk power rock band – sorta glam. As I recall they were great but I only saw them twice that I can remember. The Truckadelics were a long-lived Frankie Camaro project. I have video of Andrew Wagner singing an original Frankie number, “Unlucky Highway”, in the basement of the Litter Box at a party, possibly this one. The parties in the basement with bands at this house remain epic in scope – I recall one in particular in which the keg was tapped and completely consumed in less than thirty minutes. Occasionally, I am introduced to someone here in Seattle who happened to be in Bloomington during this era and recalls the parties at the house. I cut the stencil at full size into a piece of heavy drawing paper, and used a variety of spraypaint colors and on-the-fly paper masking to accomplish the variant color effects. This is one of the most ambitious stencil pieces I did. For many years I would attend punk rock shows with no money in my pocket and hang out by the front door of the show, selling a stencil to be sprayed on whatever people were wearing for a measly buck. I would clean up, and usually had money for beer after the show. I still have almost all of the stencils I cut – there were thirty or so as I recall, some as elaborate as this image. I actually got a “real” job from a promoter who worked for the University Student Board from this flyer – he came to the show and asked me to make a flyer for a Replacements show he was booking. I did the job for free plus four tickets to the show, but I don’t think he liked the flyer I made for him. I love checking out your journal…you have to tell me the steps I gotta take to start one…hey I remember the party in question…Nothing TOO specific! Hehe! Too Cool! hey they where actually one of the best bands of the time..even if I can’t remember thier names!! Nice guys! yeah really on the make-up wearing psycho-mo-delic sludge end of the spectrum… one of them lived in the Allen building, inheriting Cindy’s (from Sally’s Dream) apartment around the time or a little before I moved in up there…I do remember they partied alot..and of course the Truckadelics…man Frankie Camero…a bloomington legend!! one of those guys that I sometimes fantasize “If I could be this guy’s manager, and he did EXACTLY PRECISELY what I told him to do I could make him a star! (in EUROPE anyway!!! )” (frankie if your reading…the offer is open!!) but he’s too strong willed for that…hey and I guess I can relate…he’s got the hoosier midwestern laid back attitude…something that I have and have a love/hate relationship with!! Hey Mike, is it just me or does the flyer omit the actual date of the party? I note it does include your street address, but how did people know when to show up? no, it’s there, Anne. The date is to the lower left of the layout, in a circle. The circle is made up of the word “July”, in front of that word are the letters “PM” and on either side of the circle are two numerals, “2” and “4”; therefore the party was on the evening of July 24th. 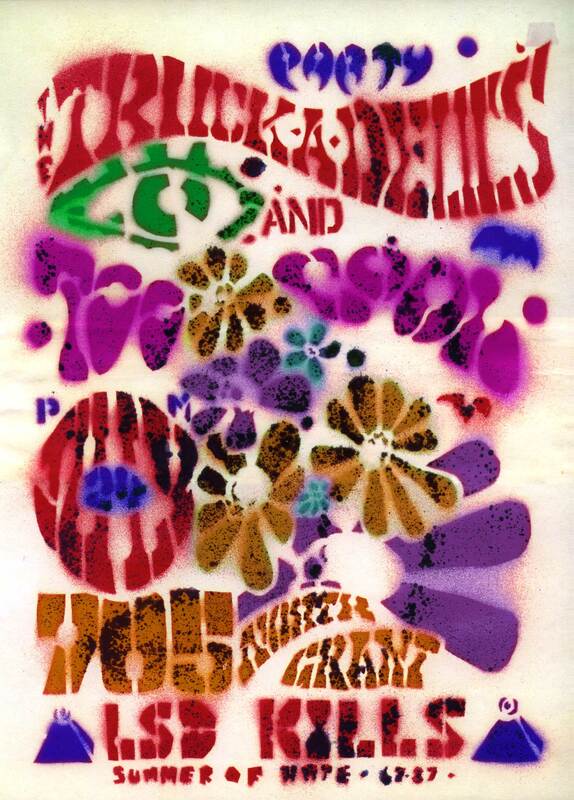 I recall fussing about legibility and deciding it was not important, because one of the historical points of sixties psychedelic poster art was that the type was sometimes wholly illegible; this acted as a device to keep uncool people away. I concluded it would do the same in this case. See, when that party happened, it you wanted to go, you (and I mean you personally, Anne Zender) knew who to ask to find out when it was. So at the time, you were cool enough.